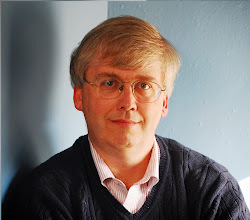 CONVERSABLE ECONOMIST: How Many Still Without Health Insurance? How Many Still Without Health Insurance? The Patient Protection and Affordable Care Act was passed in 2010. The exchanges aimed at increasing the number of people without health insurance started operating, albeit in a halting and often dysfunctional way, in October 2013. So what progress has been made in reducing the number of Americans who how lack health insurance? I checked four sources: the Current Population Survey from the U.S. Census Bureau, the American Community Survey also from the Census, the National Health Interview Survey from the Centers for Disease Control, and the Gallup Poll. Before listing the results, I'll just point out that my expectations were not high. No one who took more than a minute to consider the actual legislation ever expected that it would provide universal health insurance. As one example, here's a White House announcement in September 2010 predicting that the act would reduce the number of Americans without health insurance from about 50 million to about 18 million. In May 2013, the Congressional Budget Office estimated last hat the implementation of the Affordable Care Act would reduce the number of Americans without health insurance from 55 million in 2013 to 31 million in 2016, with most of that drop coming from people signing up for the new insurance "exchanges" and some coming from an expansion of Medicaid. But the CBO also estimated that by 2023, there would still be 31 million uninsured. These estimates were noticed: for exmaple, here's a June 2013 a Washington Post story about those 31 million. So after all the tumult and the shouting over the Affordable Care Act, both, during and after its passage, its White House supporters optimistically expected it to solve about 60% of the problem of Americans lacking health insurance, and nonpartisan sources like the CBO thought it might address about 40% of that problem. The CPS [Current Population Survey] is the longest-running survey conducted by the Census Bureau. The key purpose of the CPS ASEC [Annual Social and Economic Supplement] is to provide timely and detailed estimates of economic well-being, of which health insurance coverage is an important part. . . .Traditionally, this report has included detailed comparisons of year-to-year changes in health insurance coverage using the CPS ASEC. However, due to the redesign of the health insurance section of the CPS ASEC, its estimates of health insurance coverage are not directly comparable to estimates from prior years of the survey. ... The redesigned CPS ASEC is based on over a decade of research, including two national field tests as well as cognitive testing. If government statisticians had a fan club, I'd be sitting in the front row beaming. But no matter the reasons (the plans for the change were set years earlier, limits on funding precluded doing two surveys, and so on), the timing of this change was a blunder. The survey reports: "In 2013, the percentage of people without health insurance coverage for the entire calendar year was 13.4 percent, or 42.0 million." Whether this was higher or lower than previous years cannot be answered using this data. 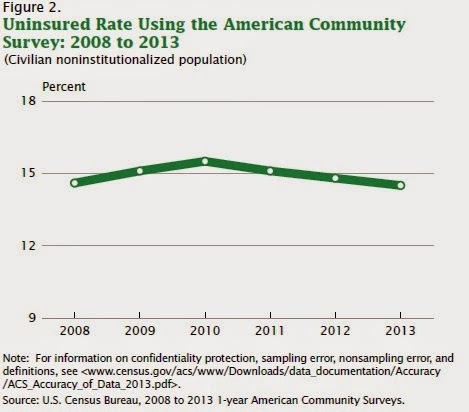 However, the Census points to another sukrvey, the American Community Survey, which has data on the share of those without health insurance from 2008 to 2013. The results isn't especially informative: a small rise in the share of uninsured during the Great Recession, and a small fall since then. The National Health Interview Survey from the Centers for Disease Control has been done since 1957. Here are the preliminary results released in mid-September with regard to health insurance for the survey carried out in March 2014. Again, the pattern shows a rise in the share of uninsured during the Great Recession, and a fall since then, without a big break from trend. For those looking for evidence that the share of uninsured is falling, the strongest evidence comes from the most recent Gallup survey data. This data goes through the third quarter of 2014, and shows a substantial fall in the share of those without health insurance since fall 2013--when the efforts to start covering more of the uninsured kicked into gear. The Gallup data is the only one of these sources that tracks up through third quarter of 2014. The drop in the last year almost surely means something. But it's concerning that the patterns of the Gallup data do not match the overall pattern of the systematic and well-established government surveys. In comparing surveys, the level of a certain answer may be higher or lower, depending on exactly how a question is worded, but the change in the level should still show similar timing. 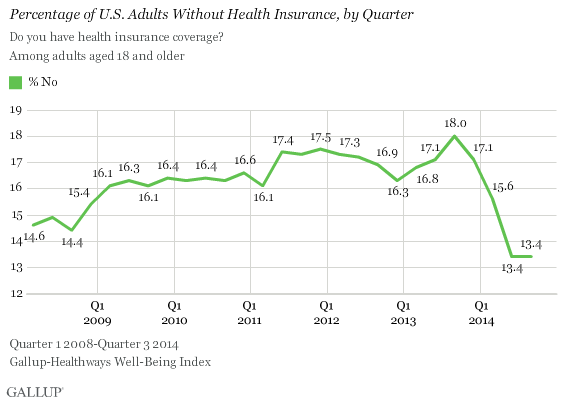 The government surveys show the share of uninsured peaking in 2010, while the Gallup data shows a more-or-less steady rise in the share of uninsured, with a couple of puzzling downward bumps, until third quarter 2013. It may be that people's awareness of health insurance, or whether they think they have it, or their concern over having health insurance, may be fluctuating in ways that have a bigger effect on the Gallup poll results than on the other surveys. At this stage, there are bundles of the news stories about how many people signed up for the health insurance exchanges or for the expansion of Medicaid, and how the share of people getting health insurance through their jobs is falling. But what's the overall effect? The national surveys don't show show that the 2010 health care legislation has had much effect at all on the share of those without health insurance, at least not through the first quarter of 2014. 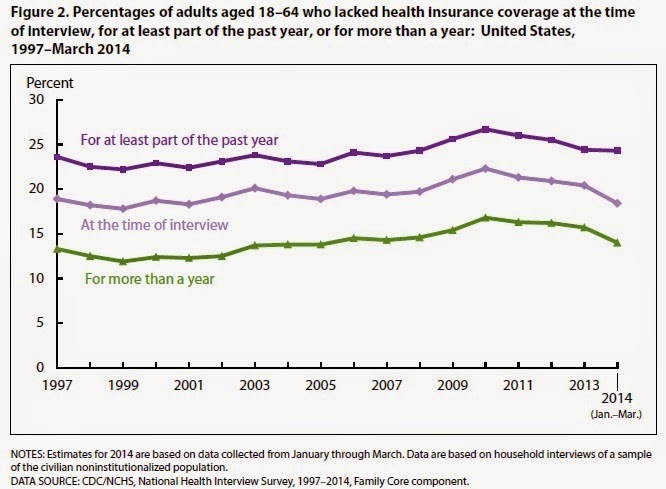 Next March and June, when the National Health Interview Survey preliminary data for the later part of 2014 are published, we should start to have a better picture--and a sense of whether the drop shown in the Gallup data holds up in better-established surveys. In September 2015, we'll have data for 2014 from the Current Population Survey, too. But it should be crystal-clear at this point that if you believed the Patient Protection and Affordable Care Act would provide anything remotely close to universal health insurance coverage, you were badly misled. So far, the CBO-style predictions that the legislation was headed for addressing less than half of this problem seem on the mark--and perhaps even a bit too optimistic. College Studying: 16 Hours Per Week? Is Better Communication Longer and More Complex?